The Ace of Swords is the seed of the intellectual power, the origin and beginning of the airy world of Yetzirah, which implies thinking, analysing, realizing through logic and mind. 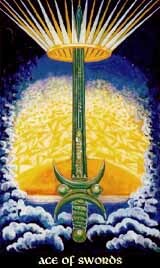 Like every Ace, it represents the unstructured primary matter of its suit, the undifferentiated unity, therefore the Ace of Swords is the beginning of thinking, a first idea, a first thought or impulse from the mind and the essence of the element of Air. So the card can stand for a first idea or realization, a new view of things, or simply tell us that we should let our mind work rather than following our emotions only. It also reminds as that the Ace is only the seed, that it needs growing and experience to proceed.